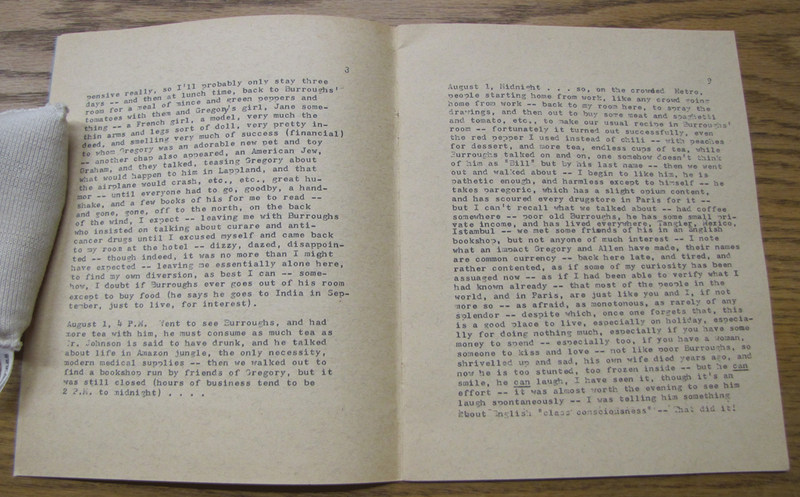 Vacationing in Paris in the summer of 1958, the Scottish poet Gael Turnbull kept a journal documenting his visits to William Burroughs and Gregory Corso at the Beat Hotel. 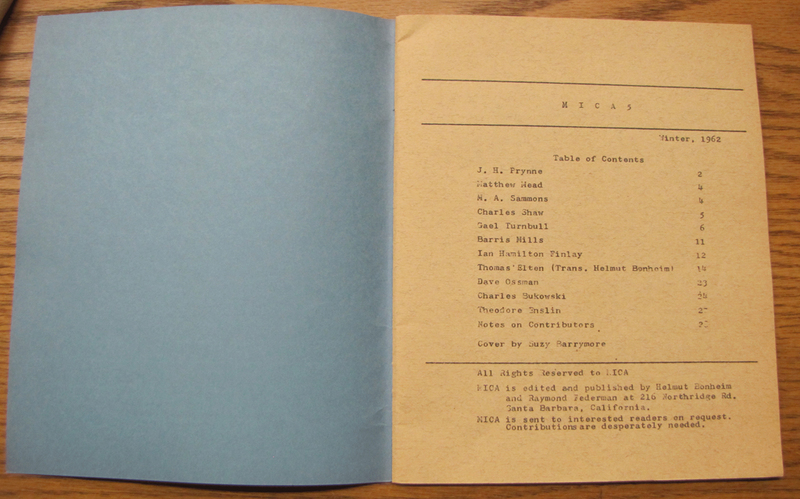 Excerpts from the journal were published in 1962 in Mica #5, a poetry magazine featuring Charles Bukowski, Ian Hamilton Finlay, and others. July 31, 2:30 P.M. Gregory wasn’t in his room, though the landlady declared that he usually slept until noon, so he left a note in the door incredible sort of little attic under the roof, to get to which one has almost to crawl on hands and feet around the last little spiral turn — so I knocked on the door of this other friend of Ginsberg’s, called Bill Burroughs — he only just up, in pajamas, looking like a man dying of cancer, thin, pale, unsteady, the curtains still drawn — he made some tea, and we exchanged the usual greetings — and he told me the news, that Gregory was going to Lappland, with some explorer he had met only yesterday — then, as we finished our tea, and Burroughs dressed an older man, about 40, I’d say, very slow speaker — two themes in his talk, a hatred of America, the physical culture of it, and also an interest in all forms of drugs of all kinds — eventually monotonous, but despite this, a rather pathetic sort of sad stick, one couldn’t help liking him — Gregory came in, small, a monkey grin of an Italian face, restless almost aggressive at times, under pressure, dynamic, black curly hair and burning black eyes, a face of a faun, something elemental and Mediterranean, in a miniature bouncing sort of way — not really Puck nor really Pan, neither comparison fits, and yet one wants to make one — much, indeed, how I would imagine a mixture of Poe and Villon — in some excitement partly repressed over the trip to Sweden, apologetic to me for leaving as I came, but it was quite obvious to me that he had to go as he had to breathe — walking back and forth, up and down the room — every now and then, grinning in spontaneous friendship like a street urchin — then intent again, off to the North Pole to write a poem that would melt all the icebergs — So he wanted me to take his room while he was gone, and took me up to see it — the walls covered very beautifully with colored picture postcard prints, a bit like a stamp collection except that the result was more of a mosaic of Bagdad — he has a black cloak with a royal blue silk lining to it, and a silver headed staff, very priestly indeed, very much the Druid chanter, or a pixie pretending to be one — sometimes his face is cruel, an intensity, that nothing should stop him — speaking of Michaux and various people — then about Kerouac’s book which he disliked (though admitting the talent) because of the esthetic wonder-working vision of America (e.g. Wolfe, Whitman, Dreiser) which he believed false, and wrong — obviously, America was more than that — and then on to W.C.W. 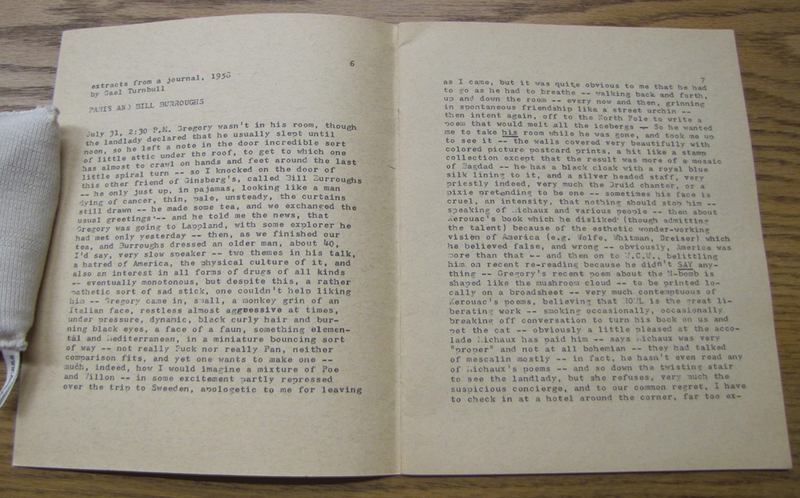 [William Carlos Williams], belittling him on recent re-reading because he didn’t SAY anything — Gregory’s recent poem about the H-bomb is shaped like the mushroom cloud — to be printed locally on a broadsheet — very much contemptuous of Kerouac’s poems, believing that HOWL is the great liberating work — smoking occasionally, occasionally breaking off conversation to turn his back on us and pet the cat — obviously a little pleased at the accolade Michaux has paid him — says Michaux was very “proper” and not at all bohemian — they had talked of mescalin mostly — in fact, he hasn’t even read any of Michaux’s poems — and so down the twisting stair to see the landlady, but she refuses, very much the suspicious concierge, and to our common regret, I have to check in at a hotel around the corner, far too expensive really, so I’ll probably only stay three days — and then at lunch time, back to Burroughs’ room for a meal of mince and green peppers and tomatoes with them and Gregory’s girl, Jane something — a French girl, a model, very much the thin arms and legs sort of doll, very pretty indeed, and smelling very much of success (financial) to whom Gregory was an adorable new pet and toy — another chap also appeared, an American Jew, Graham, and they talked, teasing Gregory about what would happen to him in Lappland, and that the airplane would crash, etc., etc., great humor — until everyone had to go, goodby, a handshake, and a few books of his for me to read — and gone, gone, off to the north, on the back of the wind, I expect — leaving me with Burroughs who insisted on talking about curare and anti-cancer drugs until I excused myself and came back to my room at the hotel — dizzy, dazed, disappointed — though indeed, it was no more than I might have expected — leaving me essentially alone here, to find my own diversion, as best I can — somehow, I doubt if Burroughs ever goes out of his room except to buy food (he says he goes to India in September, just to live, for interest). August 1, Midnight… so, on the crowded Metro, people starting home from work, like any crowd going home from work — back to my room here, to spray the drawings, and then out to buy some meat and spaghetti and tomato, etc., to make our usual recipe in Burroughs’ room — fortunately it turned out successfully, even the red pepper I used instead of chili — with peaches for dessert, and more tea, endless cups of tea, while Burroughs talked on and on, one somehow doesn’t think of him as “Bill” but by his last name — then we went out and walked about — I begin to like him, he is pathetic enough, and harmless except to himself — he takes paregoric, which has a slight opium content, and has scoured every drugstore in Paris for it — but I can’t recall what we talked about — had coffee, somewhere — poor old Burroughs, he has some small private income, and has lived everywhere, Tangier, Mexico, Istanbul — we met some friends of his in an English bookshop, but not anyone of much interest — I note what an impact Gregory and Allen have made, their names are common currency — back here late, and tired, and rather contented, as if some of my curiosity has been assuaged now — as if I had been able to verify what I had known already — that most of the people in the world, and in Paris, are just like you and I, if not more so — as afraid, as monotonous, as rarely of any splendor — despite which, once one forgets that, this is a good place to live, especially on holiday, especially for doing nothing much, especially if you have some money to spend — especially too, if you have a woman, someone to kiss and love — not like poor Burroughs, so shrivelled up and sad, his own wife died years ago, and now he is too stunted, too frozen inside — but he can smile, he can laugh, I have seen it, though it’s an effort — it was almost worth the evening to see him laugh spontaneously — I was telling him something about English “class consciousness” — That did it! August 2, 10:50 P.M. … a few minutes walk, to the Seine again, and the queer seclusion of the banks, very quiet, very lazy, very intimate, very much the reverse of all the pomp and napoleonic thunder (and the French kings too, he was the last of them) — very much the Paris, by the river, of lovers and painters and idlers — so on the Metro, back to Burroughs, where I made up the rest of the spaghetti, and we drank some red wine with it, and talked — he has met Auden, in New York, and imitated his mincing priggish way of talking — said what a petty tyrant he is, one goes to listen to the master, but isn’t allowed to interrupt — told me about Chester Kallman, Auden’s boy friend, a young Jew only 15 when Auden picked him up — and on, and on, poor old Burroughs who takes opium which he extracts himself from paregoric with great labor — says he’s been to nearly every pharmacy in Paris to buy it — now I had a headache, and my legs a bit sore, and two young chaps came in to see Burroughs who were apparently addicts, but pitifully young and quite empty headed — so I left, to take a brief walk but feeling lonely …. …. to Burroughs’ room — but he is in a bad mood, I can tell, because he has taken an extra dose of opium, to deaden the pain in his heart, and his face is a mask, sunken, his speech maddeningly slow — he talks of his theory of addiction of a biological requirement — and of how there is no boredom under opium, one can’t feel bored, because boredom arrives from undischarged tension, and then the tension is cut off there is contentment — he says he has sat looking at his show [sic] for several hours at a time, quite content — and we expect a visitor, Allen Auson [Alan Ansen? ], a wealthy literary dilettante from Venice, American, but he doesn’t come — so B. goes out to shop, a last meal, scrambled eggs and the peaches with real, heavy almost puttlylike rich cream, and red wine, and biscottes, how very good, a feast indeed — and B. begins to warm up now, he even smiles, and is gay in a risque sort of oblique manner, I can tell that he has enjoyed my visit, has even felt a little warmth in his heart — I try to draw him, but not much luck with it — hurry, hurry, or I’ll miss my train — Ah, so, farewell — good luck, it’s been good, so, perhaps we’l see each other again — an awkward hand clasp, how trivial the handclasp is, how much better to kiss, a David and Jonathan would have kissed — he, gaunt, grinning in a silly way, waving with one arm like a mechanical soldier — good by, good by. 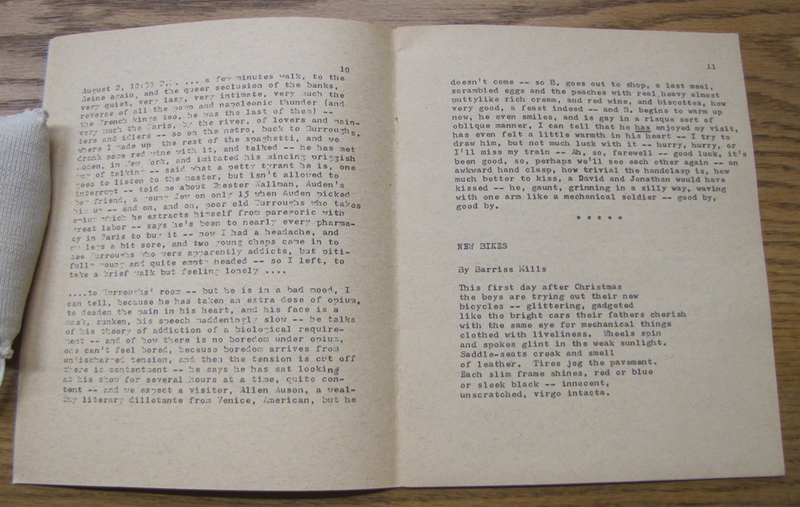 Written by Gael Turnbull in 1958 and published by RealityStudio on 19 May 2010. Many thanks to Richard Owens for providing the pictures of Mica. I seem to recall having read this somewhere else, though I may well be wrong. 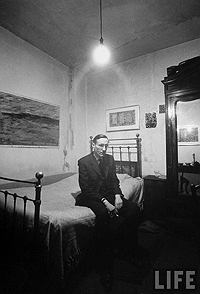 And trust a bloody Scot to be talking to William S Burroughs about English class consciousness! Perfect! Thanks for making this available. Gael Turnbull should get more attention. Being a medical doctor he was kind of a British counterpart to William Carlos Williams. It’s interesting that there is absolutely no Scottish colloquial slanguage in here; very prim proper puritan English.